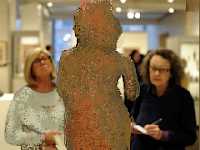 Federal agents raided the Nancy Wiener Gallery on Thursday, the latest move in an aggressive crack down on the trade in ancient Asian art that has targeted several leading dealers and auction houses and shaken up New York’s Asia Week art show. Federal agents were given a court order to seize a Kushan relief valued at $100,000, a limestone sculpture of Shiva and Parvati valued at $35,000, and a 10th Century bronze Buddha valued at $850,000, in addition to documents and business records related to the objects, court records show. From all this activity, you'd think Kapoor was the only source of dodgy antiquities on the US market. Or is he the one who has become the easiest to use for publicity-points with others getting off scot-free? Vignette: Potential clients noting collecting history? Some Recent Looting at Palmyra? How to tell a Looted Object? Yet Another Kapoor Piece in Australian Museum? Washington Bible Museum After-the-Fact Propriety? Baldwin's Don't Handle... Questions very well. Who are They Trying to Kid? "The Celts", they say "Could not Solder or Weld"
PAS Just for Metal Detectorists Now? RESCUE AGM and The IoD: "Much of the discussion was around the Treasure consultation"